If one were to examine the Interclub and Erie Yacht Club Trophies they would find the name of Captain Crowell and his pristine yacht DEVSIRE many times over. Merle was a wonderful sailor starting his sailing career about 1947 on his motor sailor HURRICANE, through the years he “upgraded” his yachts ending with a C&C 39. Merle was an avid racer always enjoying the sport to the umpteenth degree a real Corthinin Sailor. He was famous for keeping everything on his yachts pristine and up to date. If there was a new type of sail available Merle would buy it and try it out. Any of you remember the “Venturi Spinnaker”? He was so famous for being clean and his crew were known as the “Joy Boys Of Merle Crowell” and often times when DEVSHIRE arrived the entire fleet would burst out with a course of Merle’s song; “OH WE ARE THE JOY BOYS OF MERLE CROWELL”. 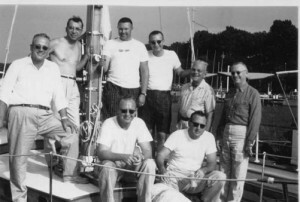 All kidding aside Merle was one of the founding fathers of our beloved Lake Erie Interclub Cruise. When DEVSHIRE arrived in Port Dover she would be moored at the dock on Coleman Point across from the club. It was there that the “boys” would start drinking Gordon Gunnison’s famous Mint Julep’s. The “boys” would lay in wait for some young sailor or sailors cruising down the river or dock and casually invite them aboard for a little “drinkee poo”. These Mint Julep were powerful and a little addicting, one would lead to two and for most victims that was the end of the day and they would have to sleep it off. Some were know to peacefully sleep in the grass until race time the next day. All in all, Merle was a great guy, a generous owner and tolerant of his crew’s short comings. It was always fun sailing with him! I have spent a major portion of my life living and racing on board my late husband Bob’s boat MASKER. To be perfectly honest, that after thousands of miles and hundreds of races, fixing meals for up to 18 to 20 crew members, at my age things start to blend together. We always loved sailing the Interclub, the competition and renewal of old boating friendships after a long winter was something to look forward to. The Erie-Dover race was always great however after arriving: I remember the wonderful parties; going into town for fantastic Dover “foot longs” and fries at the Arbor; Erie Beach’s outstanding Perch Dinners; of course heading to the government store to re-stock our depleted supplies; Verna Gamble inviting the entire crew to her house for dinner that she and Renee Martin prepared; a trip to Simcoe to buy some of that super cheese and a basket full of mushrooms on the way back. Once we reached Buffalo it was over for another year. Happy 50th to all of you Sailors!